This series are in the 3051 mug shape. 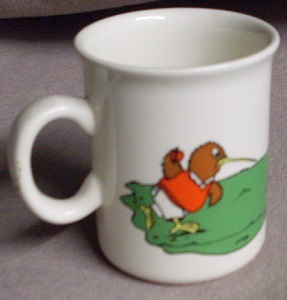 This Kiwi Sports Rugby Mug d84434 is just so cute !! I noticed that this series is on three different shaped mugs on the Portage Collection, but the Price List from the Auckland Museum has this Pattern Number for the 3051 mug. Ev, Should the Kiwi fishing mug go in the gallery with the other Kiwi sports mugs or not? Hi haselnuss, I don't have a pattern number for the fishing one that you put on and I am wondering if I have been putting up the wrong series .....? I have been meaning to look into this, as I know that the Portage site have some of these. I guess I had better get on with it now and do some research as it was all fine until the fishing one turned up. 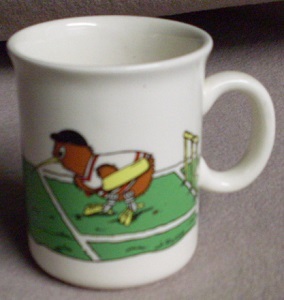 The Kiwi Sports Mugs records I have only have four sports and no pictures and are shape 3051. Thank you for reminding me as there are so many things that I mean to do and then they slip away when a new challenge comes up. 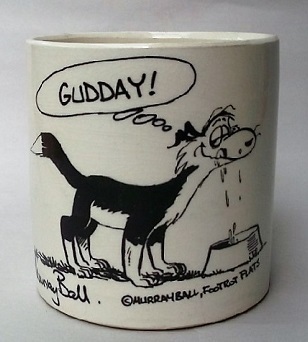 As I couldn't find anything conclusive, I have added your Kiwi fishing mug to the Patterns Gallery along with the others, without a pattern number haselnuss.